Born: 1867, Kent, United Kingdom. Died: 22 December 1934, Johannesburg, South Africa. Arthur Leo Chambers, mining engineer and general manager, was educated in Taunton, Somerset, England, and in Canada. He became a member of the (British) Institution of Mining and Mechanical Engineers and later also a member of the (British) Institution of Mining and Metallurgy and a Fellow of the Royal Colonial Institute. In 1889 he married Clara Walker Binstead, with whom he had two children. That same year he came to South Africa. Among others he spent six years in the Barberton area as general manager of the Royal Sheba Gold Mining Company, and six year in Rhodesia (now Zimbabwe), where around 1904 he worked as consulting engineer in the vicinity of Gweru. By 1906 he had moved to Messina (now Musina), as general manager of the newly founded Messina (Transvaal) Development Company, which was responsible for opening up the rich copper deposits discovered there by Colonel J.F. Grenfell* in 1903. By 1913 Chambers had moved to Johannesburg, where he appears to have resided most of the time for the rest of his life. During the early nineteen-twenties he had a prospecting contract with the Bathlako tribe, who owned the farm Vlakfontein No. 305 near Rustenburg. In 1934, the year of his death, several base mineral leases in respect of crown land in Namaqualand were transferred to him. Chambers was a member of the Chemical and Metallurgical Society of South Africa by 1899 and continued his membership when the society was renamed the Chemical, Metallurgical and Mining Society of South Africa after the Anglo-Boer War (1899-1902). At one of the society's meetings in 1913 he participated in the discussion of a paper dealing with copper mining at Musina. 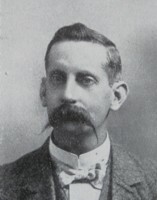 He became a member of the Geological Society of South Africa in 1906 and was still a member in 1915, but his membership lapsed during or shortly after World War I (1914-1918). In 1915 he published a paper on "Karoo coal prospects" in the South African Mining Journal. Chemical, Metallurgical and Mining Society of South Africa. Proceedings, 1902-1903, Vol. 3, list of members; Journal, 1904-1905, Vol. 5, list of members. Geological Society of South Africa. Transactions, 1906, Vol. 10, list of members; Proceedings, 1915, Vol. 18, list of members. National Archives Repository (TAB), Source MHG, Vol. 0, Ref. 87254: Death notice, Arthur Leo Chambers. National Automated Archival Information Retrieval System (NAAIRS), at http://www.national.archives.gov.za/naairs.htm Documents relating to Chambers, A.L. / Chambers, Arthur Leo.